The Donghak Peasant Revolution (동학 농민 혁명; 東學農民革命; donghak nongmin hyeogmyeong), also known as the Donghak Peasant Movement (동학 농민 운동; 東學農民運動; donghak nongmin undong), Donghak Rebellion, Peasant Revolt of 1894, Gabo Peasant Revolution, and a variety of other names, was an armed rebellion in Korea led by aggravated peasants and followers of the Donghak religion, a panentheistic religion viewed by many rebels as a political ideology. In 1894, the magistrate of Gobu, Jo Byeonggap, had created various bogus laws and forced the peasants to build reservoirs and settle in unowned lands in order to get rich from taxes and fines. In March, angered peasants allied under Jeon Bongjun and Kim Gaenam, beginning the Gobu Revolt. However, the Gobu revolt was suppressed by Yi Yongtae, and Jeon Bongjun fled to Taein. In April, Jeon gathered an army in Mount Baek and recaptured Gobu. The rebels then proceeded to defeat governmental forces in Hwangto Pass and the Hwangryong River. Jeon then captured Jeonju Fortress and fought in a siege with Hong Gyehun's Joseon forces. In May, however, the rebels had signed a truce with the governmental forces, and built agencies called Jibgangso that handled affairs in rebel-controlled areas. This somewhat unsteady peace continued throughout the summer. The frightened government asked the Qing dynasty for help, and it sent 2,700 soldiers to Korea. Japan, angered that the Qing government, had not informed Japan (as promised in the Convention of Tientsin), started the First Sino-Japanese War. The war resulted in an expulsion of Chinese influence in Korea and also signaled an end for the Self-Strengthening Movement in China itself. Growing Japanese dominance in the Korean peninsula had caused anxiety amongst the rebels. From September to October, the Southern and Northern leaders negotiated the plans for the future in Samrye. On October 12, a coalition army of Northern and Southern Jeobs were formed, and the army, numbering 25,000~200,000 (records differ), went on to attack Gongju. After a number of battles, the rebel army was decisively defeated in the Battle of Ugeumchi, and the rebels were again defeated in the Battle of Taein. Hostility continued deep into the spring of 1895. The rebel leaders were captured in various locations in the Honam Region, and most were executed by a mass hanging in March. 19th-century Korean society was extremely unstable, due to a high number of rebellions. The series of revolts began with the Gwanseo Peasant War and effectively ended with the Donghak Peasant Revolution. The first large revolt was the Gwanseo Peasant War (1811-1812). The rebel leader Hong Gyeongnae prepared for the rebellion since 1801. By September 1811, Hong Gyeongnae had gathered an army in Chudo Island , gathering support from the rich landowners. Hong Gyeongnae captured most of the Gwanseo Region in ten days. However, his army was defeated in the Battle of Songnim, and by January 1812 was isolated in Jeongju Fortress. Governmental forces finally collapsed the walls of Jeongju by using eleven tons of explosives dug under the wall. All male rebels above the age of ten were executed. Another large-scale revolt was the Imsul Peasant Revolts (1862), in which 71 towns simultaneously revolted. The government often taxed dead people or infants, although only those over fifteen were legally eligible to be taxed. Moreover, most of the remainder were given to the landowner. The revolt began in February 10, Jinju. The people of Jinju captured the magistrate Baek Nakshin, and burned landlords Jeong Namseong, Seong Buin, and Choe Jinsa at the stake. Their sons were killed as well while attempting to save their fathers. The revolts soon spread throughout most of Southern Korea, and continued until January, 1863. The people of Gwangju even rode to Seoul. The revolts were most severe in Jeolla Province, the later site of the Donghak Revolution, in which 38 of 54 towns actively revolted. Various secret societies formed, apart from the rebellions, including the Salbangye, 'Association of the killers of the Yangban (aristocrats)', the Saljugye, 'Association of the killers of the (slave's) masters', the Salryakgye, 'Association of killers and robbers', the Geomgye, 'Sword association', the Judogye, 'Association of the drunk', the Yudan, 'League of Wanderers', and the Nokrimdang, 'Group of the Green Woods' (Nokrimdang were 'noble thieves', who stole from the rich and gave to the poor). By 1860, I heard rumours that the people of the West worship God, and caring not for wealth, conquer the world, building temples and spreading their faith. I was wondering whether I, too, could do such a thing. On an April day, my mind was unnerved and my body trembled.......Suddenly a voice could be heard. I rose and asked who he was. "Do not fear nor be scared! The people of the world call me Hanulnim. How do you not know me?" Said Hanul. I asked the reason he had appeared to me. ".......I made you in this world so that you could teach my holy word to the people. Do not doubt my word!" Hanulnim replied. "Do you seek to teach the people with Christianity?" I asked again. "No. I have a magical talisman......use this talisman and save the people from disease, and use this book to teach the people to venerate me!" Donghak was a mixture of various religions. Its core tenets and beliefs (monotheism, sacred book, organized religion) are similar to Christianity. Choe himself said that "the meanings [between Christianity and Donghak] are the same; only the words are different". [This quote needs a citation] The Donghak conversion rite, in which hundreds of people gathered in an open place and knelt before a cup of clean water, was partly influenced by the Christian baptism ritual. However, many direct influences were from shamanism and folk beliefs. Witnesses record that Choe Jeu participated in animistic rituals to mountain deities. His incantations and the Sword Dance were also derived from shamanism. Certain beliefs were unique to Donghak. Choe Jeu said that "All humans are Hanulnim". Choe promoted human equality, and created certain ideologies such as the belief that the world was a cycle of 5,000 years (Jeoncheon and Hucheon), and that this cycle was ending to make way for a new world. This made Donghak potentially dangerous to the Joseon Dynasty, which banned the religion and executed Choe in 1864. Choe Jeu was executed in 1863 for 'Tricking and Lying to the Foolish People'. Nevertheless, Donghak spread all across Gyeongsang Province by the 1870s, causing need for a better organization. Donghak was organized into 'Jeob' and 'Po'. A 'Jeobju'(접주，接主) administered a 'Jeob'. For example, Jeon Bongjun, the leader of the revolution, was Jeobju of Gobu. Under a Jeobju was a 'Myeonjeobju'. In large towns (such as Taein or Jeonju) were a 'Great Jeobju', as Kim Gaenam was the Great Jeobju of Taein. Various Jeobs were organized into a 'Po', and a 'Poju' led a Po. The 'Gyoju', at the time Choe Sihyeong, led the whole Donghak religion. In 1871, Yi Pilje, Jeobju of Yeonghae , revolted using the Donghak infrastructure. The revolt failed, but proved that Donghak was a danger to the feudalistic Korean society. Yi Pilje's Revolt seriously undermined Donghak in Gyeongsang Province, causing Choe Sihyeong to spread the religion to the populous provinces of Chungcheong and Jeolla. Choe wandered around these two provinces, spreading Donghak. Son Hwajung was one of the first to convert in 1881, and he converted Jeon Bongjun in 1891. Son Byeongheui was converted in 1882 by Choe himself, as was Kim Gaenam in 1890. As seen below, he claimed conversion in 1891. Expel all Western missionaries and merchants. We.......are determined to follow this new doctrine (Donghak) only because we want people to reform themselves, to be loyal to their king, to show filial piety to their parents, to respect their teachers, and to show friendship to their fellow men. In response, Gojong ordered the Northern messengers to "go to your homes. If you do, I may grant your plea". Meanwhile, Seo Inju and the Southern Jeob were threatening Westerners and Japanese with bodily harm, saying "If you do not flee by March the seventh, we shall all kill you. You are causing injustice in a foreign land." This was attached to American, French, and Japanese legations, Christian churches and schools, and districts with a large number of foreigners taking residence. Reclaim the honour of founder Choe Jeu. Cease the persecution of Donghak believers. Cease all imports of foreign merchandise, and wear cotton and use necessities made in Korea. Dispose the Min family of oligarchical power. Ban the inflation-causing Dangojeon coin. Northern Jeob leaders, such as Choe Sihyeong and Son Byeongheui, feared that the government would execute Donghak believers, and stopped the petition within three days. Jeon Bongjun returned to Gobu. He built Manseokbo reservoir under the already existing Min Reservoir (now Yedeung Reservoir) and took water taxes from the peasants, two sacks of rice for using the upper reservoir and a sack of rice for using the lower reservoir. He collected seven hundred sacks of rice in total. He promised that peasants who farmed abandoned land would be exempt from taxes for five years, but he forced them to pay taxes in the autumn of 1893. He fined affluent peasants for dubious crimes, including 'infidelity', 'lack of harmony', 'adultery', and 'needless talents', by which he collected 20,000 nyang (nyang was a unit of Korean currency, equivalent to seventy US dollars, making 20,000 nyang equivalent 1.4 million U.S. dollars). He taxed a thousand nyang (the equivalent of 700 thousand US dollars) to build a monument to his father, Jo Hugyun, who had been the magistrate of Taein. For sacks of rice to send to the government, he sent only sacks of spoiled rice to Seoul, taking unspoiled sacks for himself. Of these, the construction of Manseokbo reservoir caused the most fury. Yedeung Reservoir had caused the Baedeul fields to not suffer from starvation ever since Yedeung was built. However, the construction of the new reservoir blocked creeks in the region, causing widespread damage through flooding. Donghak believers and angered peasants began forming a rebel army. They used the Sabal Tongmun, in which names were written around a circular cone as to form a circle. The Sabal Tongmun made the leader of the writers unclear (because it was impossible to know who had signed their name first). On January 10, 1894, a thousand rebels gathered in an abandoned horse ranch. Splitting into two armies, they destroyed three of the four gates of Gobu and occupied the government office. Jo fled Gobu to Jeonju (he was exiled after the war ended, and returned from his exile to become a judge). For a week, the rebels destroyed prisons and freed innocent prisoners, armed themselves with weapons from the local armory, punished corrupt officials who had been captured, returned taxed and fined property to original owners, and destroyed Manseokbo Reservoir. However, the crisis ended when Jo was replaced by Park Wonmyeong, who convinced rebels to disband. Jeon and Kim went south to Mujang, where they met Son Hwajung. The rebels properly organized in Mujang, and in March 20, the 4,000 rebels of Mujang turned towards Mount Baek, Gobu. While camped in Mount Baek, the army grew to tens of thousands. Choe Deokyeong's 300 peasants joined them from the north. Here, the aphorism came: "When sitting, a white mountain; when standing, a bamboo mountain". (rebels mostly wore white, and used bamboo spears. The term may have appeared earlier, however, as Mount Juk, meaning 'bamboo mountain', could only be seen when standing, as it was covered by smaller Mount Baek, 'white mountain'.) In March 22, the rebels destroyed the reservoir and burned down governmental offices and storages. Do not kill the innocent and refrain from eating farm animals. Open the Hucheon through loyalty and piety and appease the people. Defeat every single barbarians of Japan and purify the holy land. Drive the army into Seoul and kill every member of the Min family. The rebels also "did not seek alcohol and women and did not smoke tobacco". [full citation needed] They did not forcefully take food, but paid for them in money. The government sent Yi Gyeonghyo to quell the rebellion, and made an emergency army of 700 soldiers and 600 merchants. The 10,000 rebels lured governmental forces into Hwangto Pass. In the dawn of April the 7th, the governmental soldiers charged into the rebel camp, but found it empty. Soldiers were in chaos. Suddenly, the rebels, moving under the cover of fog, emerged from the mountains and attacked the governmental forces, killing a thousand soldiers. Most of the rebels were unharmed in the thus concluded Battle of Hwangtojae. By April 17, however, Jeon turned south to Yeonggwang, where Hong Gyehun's governmental troops were waiting. Jeon attempted to lure the troops to Jangseong, and the general Yi Hakseung chased after them. Yi Hakseung attacked while the rebels were camped on the Hwangryong River, eating lunch. The rebel leader Yi Bangeon envisioned a new strategy. The rebels fled to the mountains, then ran downhill rolling thousands of Jangtae, or chicken cages. The Jangtae blocked most bullets, thus rendering the government's superior weapons useless. Moreover, Jeon placed the rebel army so that they would divide Yi Hakseung's troops into three separate divisions. Yi Hakseung ordered the troops to use their cannons, but they did not work because the pro-rebel villagers had put water inside the cannons (following the incident, rumours spread throughout the government forces that a ghost had destroyed the cannons). More than 300 governmental forces but only two rebels died in the Battle of the Hwangryong River. After the Hwangryong, a royal messenger came to Jeon with bribes to quell the rebellion. Jeon killed the messenger, but took the needed money. Jeon then turned north and occupied Jeonju, the largest city in Jeolla province at the time. not choosing to take Naju to the south. Hong Gyehun quickly returned north, beginning the Siege of Jeonju Fortress. In May 1, Hong Gyehun began to fire cannons into Jeonju, killing and burning civilians and civilian properties. In May 2, however, King Taejo of Joseon's portrait was burned down by Hong's incessant bombing, ceasing the attack. In the morning of May 3, Jeon led an attack on Hong's camp, but was defeated by superior firepower. The Jangtae only hindered the rebels in Jeonju's mountainous location. Jeon himself had a shrapnel lodged in his shoulder from this attack. Meanwhile, in April 29, the administrator of Jeonju, Kim Munhyeon, had appeared in Gongju and told the government of the fall of Jeonju. Unable to control the rebellion, the government of Joseon formerly requested the military assistance from both Japan and China. In May 3, 1,500 Qing Dynasty forces appeared in Incheon. The same day, 6,000 Japanese forces also landed in Incheon. The Japanese inquired why Qing had not notified the Japanese government in accordance to the Convention of Tientsin, and soon caused the First Sino-Japanese War. Punish those who became illegally rich. Free the Cheonmin class, and cease the branding of butchers. Legalize the remarriage of widows. Pick politicians based on qualities, not families. Punish those who cooperate with the Japanese. Give their land to all peasants. Following the truce, the rebels climbed out of the fortress using ladders, and Hong entered the empty fortress. The summer of 1894 was marked by rebel rule over most of Southwest Korea. Jeon Bongjun established the Jeollajwaudo Daedoso (Great Capital of the Two Jeolla Provinces) in Jeonju, and built Jibgangso in most towns. In Naju, Namwon, and Unbong, however, the rebels met fierce resistance from landowners. Jeon had not subdued these southern cities, as he went north after the Battle of the Hwangryong. Choe Gyeongseon attacked Naju with 3,000 rebels, and the landowners of Naju began to fortify Naju against rebel attacks. Jeon himself met the Naju landowners and convinced them to allow Jibgangso construction in Naju. However, Naju was still not under complete rebel control, and later became the center for rebel persecution. In Namwon, Kim Kaenam also battled landowners with 3,000 rebels, took the fortress, and hanged Kim Yongheon, the anti-rebel leader. Unbong surrendered at the sight of the rebels. Remaining Jibgangso include Daechang High School in Yecheon, Jinnam Office in Yeosu, Geumseong Office in Naju, Mujang Hall in Mujang(preserved by Mujang magistrates as a historical relic), and Yeosan Office in Yeosan (now a town hall). The Jeobju of the town and his assistant, the Jeobsa, administered a Jibgangso agency. Under the Jeobju were the Seogi, the Seongchal, the Jibsa, the Posa, and the Dongmong. For deciding on matters, there was a council, with the Jeobjang and Jeobsa at its head, who voted on town matters. Yi Yihwa sees this as rudimentary democracy. Among the Seogi, Seongchal, the Jibsa, and the Dongmong, the Seogi were scribes who kept records of the activities and decisions of the Jibgangso. They also reprinted orders and publications from the rebel leaders, and displayed them on marketplaces and gave them to the people. Most Seogi were progressive Yangban, as the scribes had to have literacy. Meanwhile, the Seongchal were town police, who administered the law and reported corrupt officials or Yangban to the Dongmong and Posa. Most Seongchal were killed in the Second Revolt. Dongmong were young men who arrested, imprisoned, or even flogged those reported by the Seongchal. They also had a powerful hatred for Yangban, often castrating them and using Yangban women to light candles or pour water. Dongmong also led to a curious marriage practice called 'three-day marriage'. Dongmong, searching for partners, hung white scarves on the door of a house of a Yangban who had an unmarried daughter. This meant that the daughter had to marry the Dongmong. To escape the forced marriage, fathers often found another suitable young man and made the daughter marry him within three days in secret. By November, three-day marriage had become so prevalent that the only virgins left were girls under fourteen years of age. Meanwhile, the Posa were mostly tiger hunters who served effectively as soldiers, cooperating with the Seongchal and Dongmong to fight against Yangban resistance. The rebels referred to their cause as the Dongdo (another name for 'Donghak') and to their army as the Dongdo Euibyeong, the "Righteous army of Donghak". Rebels called themselves 'Hajeob', after the lowest Donghak initiate, and called any other person, even children, 'Jeobjang', a rendering of Jeobju. While the First Sino-Japanese War raged on, Japanese troops occupied Seoul and made a pro-Japanese government there. Before the Battle of Pyongyang, Jeon's strategy seems to have been that he would crush the fleeing Japanese from the south while the Chinese soldiers chased them from the north. However, his prediction proved wrong, with a major Chinese defeat in Pyongyang. Jeon decided that he should defeat the Japanese by taking control of Korea and severing Japanese supply lines. However, knew he would have to get the support of the Northern Jeob, who commanded all Donghak outside Jibgangso-controlled areas. The government does not know the difference between medicine (Northern) and poison (Southern). They will burn both the stones (Southern) and the jade (Northern)......Hence, we must prove our allegiance to the king by conquering the South. On September 14, Northern and Southern leaders gathered in Samrye. It is said that Jeon rode a white horse in this meeting. The Northern flags said 'Conquer the South', while Southern ones said 'Conquer the Foreigners' or 'Protect the Nation'. After a month of negotiations, on October 12, Choe Sihyeong finally cried out to the Northern Jeob: "Shall we die while seated?". We shall not eat dog or chicken. The meat of a dog weakens and maddens us, and we are born from the power of Mount Gyeryong, the Rooster Dragon mountain. Eating chicken shall weaken that power. Although the army had started with 200,000 rebels, when they camped at Non Stream, 12 kilometers south of Gongju, the army was 220,000; peasants had joined them as they marched. There were also 50 Chinese soldiers, who had fled from the Sino-Japanese War. Inside the Fortress of Gongju were perhaps 3,000 governmental forces led by Gu Sangjo, Seong Hayeong, Jang Yongjin, and Yi Gidong, and some 400 Japanese soldiers led by Colonel Moriya. On October 24 and 25, the Battle of Ung Pass, or Ungchi, occurred between rebels and a coalition army of Japanese soldiers, governmental forces, and anti-rebel guerrillas. Ungchi was a pass that led straight to Gongju, and a crucial location for the rebels. However, the rebels were not able to take Ungchi. Most were armed with only bows and arrows, spears, swords and seventeenth-century style muskets, which could not defeat the superior firepower of the coalition. The Northern Jeob experienced severe casualties in Ungchi, because they lacked proper training in war. The rebels retreated south to Nonsan. Jeon and Son decided that they would capture Gongju through a different pass; Ugeum Pass, or Ugeumchi. On November 8, two battalions lured governmental forces, so that the major rebel forces would not meet a large governmental army in Ugeumchi. In 3:00 in the afternoon, the rebels concentrated the governmental forces in Yiyin and Hyopyo, where 10,000 rebels were. The other 200,000 rebels were crossing Ugeumchi. However, they encountered a Japanese battalion of 280 soldiers. The Japanese gathered the Korean forces into Ugeumchi. After night passed, the two armies clashed in Ugeumchi in the dawn of November 9. Jeon placed his army so that the rebels stretched sixteen kilometers, from Panchi to Mount Bonghwang. Jeon was at the center of this line, surrounded by flags and riding on his white horse. The government forces defended the sides (Hyopyo, Ungchi, Mount Bonghwang), while the Japanese were stationed in Ugeumchi proper. In 10:00 in the morning, the rebels charged at Ugeumchi. Because of their weak weapons, they were unable to cross Ugeumchi. The Japanese used cannons and rifles, and had proper military training. Although small groups of rebels crossed the 'death line' more than forty times, they were all shot down. After one charge at the Japanese, only 10,000 of the original 200,000 rebels were left. After the following charge, there were 3,000 rebels left. When the rebels finally retreated in November 10, only 500 rebels out of an army of 200,000 remained. And we finally destroyed the thieving raiders.......It was as if the stars themselves were falling from the sky, and the autumn leaves were being scattered on the lands. Jeon led the 500 remainder south into Taein, the rebel center. There, he gathered an army of 8,000 rebels. On November 25, the Japanese caught up with the rebels, camped in Mount Gumi. Despite rebel strategic superiority, the Japanese firepower annihilated both the rebels and the city of Taein. A historian, Park Eunsik, recorded that there was "nothing left in Taein for 40 kilometers". 40 civilian houses, along with perhaps 400 rebels, were killed. After the Battle of Taein, in November 28, 1894, Jeon formally dissolved the Donghak Army. The rebels cried: "We thought Jeon Nokdu (Jeon's nickname) would save us, but now we are all going to die". Jeon answered: "War is a game of luck. Why is it that you blame me". He then dressed up as a peasant and headed east. Jeolla Province was the revolution's center, and were completely seized by the rebels. They formed the core of the Anti-Japanese Frontier, and often aided Gyeongsang and Chungcheong rebels. Kim Inbae of Gwangyang and Yi Bangeon of Jangheung formed the core of South Jeolla rebels. Namwon and Unbong were ruled by Kim Gaenam's rebels. However, Kim Gaenam had gone to attack Cheongju far to the north, and with his absence, the governmental soldiers attacked Namwon. In November 13, the rebels were driven away from the outskirts of Namwon in a small battle. The 3,000 rebels fled to Namwon Fortress. Jo Byeongho, the governmental leader, led 2,000 soldiers armed with modern weapons to besiege Namwon. Although the fortress was bombed and shelled, the rebels did not come out. Finally, the governmental troops stacked hay around the east, west, and south walls, and burned the hay. The wooden doors burned along, and the rebels fled through the north door. Hundreds of rebels were killed in the Siege of Namwon. In Jindo, the third largest island of Korea (after Jeju and Geoje), Na Chihyeon of Naju converted the population to Donghak in January 1892. After the fall of Jeonju Fortress, the Jindo magistrate Yi Heuiseung (who, like Jo, built two monuments to himself) fled. However, Confucian scholars maintained order in the island through an army called Suseonggun. In July, Son Haenggwon assaulted Susseonggun bases, taking matchlock rifles, swords, bullets, gunpowder, and tridents. At a similar time, Park Jungjin attacked the Suseonggun at Shimijang village. He was killed, and his daughter captured; descendants destroyed the family tree and burned down the house. After arrivals of new officials, the Jindo rebels joined the Naju rebels. Most were captured and sent back to Jindo. In October 10, 1,322 soldiers, composed mainly of slaves and lower officials, were sent to defend Jindo against possible rebel attacks. In December, rebels who had fought under Yi Bangeon hid into Jindo after the Battle of Seokdae Fields. However, the rebels had lost all military power, and were captured and imprisoned. In December 27, Japanese soldiers executed fifty rebels. Cheondoism remained in Jindo until the 1950s. Gyeongsang Province had a strong Confucian influence, and the casualties of Yi Pilje's Revolt in 1871 were still fresh. It took until August for Gyeongsang rebels to begin revolting. Suppression of revolts were an organized effort, with Toposa officials specializing in anti-rebel campaigns. The forces of the Southwest coasts of Korea were special in that the forces of Jeolla and Gyeongsang Provinces cooperated to attack Jinju Fortress. They are collectively termed under the name 'Jinju Rebels'. In May 7, Kim Inbae, the Great Jeobju of Geumgu, built a Jibgangso in Suncheon, Jeolla Province. In September 1, Kim crossed the Gyeongsang-Jeolla boundary. His strategy was to charge through the southern coastline to Busan, and thus grasp the Japanese-Korean borderline. Meanwhile, Hadong and Jinju, which were Kim's target, were experiencing rebel activities. Hadong rebels were chased west by the government, joining Kim Inbae. With the guidance of the Hadong rebels, Kim Inbae captured Hadong in September 7. In Jinju, the leadership recruited rebels by sending out public documents in major markets. In September 8, 1894, 7,000 rebels gathered in Sugok Market and established the Chungyeong Daedoso, a center of rebel activities. By September 17, a joint army of Suncheon and Jinju rebels had captured Jinju fortress. The rebels held flags signaling their own Po and Jeob, and spread manifestos titled To the People of the Towns of Gyeongsang throughout nearby villages. The manifesto said the following. The state is the people, and the people are the state. We have had a council in Jinju in order to punish the Japanese invasion. All believers in Donghak must rise up and punish corrupt officials who support the Japanese. Report anti-rebel armies to the Chunggyeong Daedoso. In response to the fall of Jinju Fortress, the government sent Ji Seokyeong as Toposa of Jinju, a government official who specialized in the suppression of Donghak revolutions. In October 10, 400 rebels gathered in Mount Geumo, a few kilometers west of Jinju, where they were ambushed by Japanese forces. Although the rebels lost more than seventy men in the consequent Battle of Mount Geumo, the rebels still held Jinju Fortress. In October 14, 5,000 rebels defended Mount Goseong Fortress against the Japanese. The rebels, using the fortress, fought fiercely against Colonel Suzuki's Japanese battalion, but were ultimately defeated by Japanese firepower. 187 rebels were killed, causing Mount Goseong to be called Mount Gosireong, after the sound that a decomposing corpse makes when it rains. The remnants of the rebels fled to Mount Jiri, where they became the Righteous Army. Chungcheong rebels were under the command of Son Byeongheui, who led the Northern Jeob into battle at Ugeumchi. After defeat at Ugeumchi, Son continued the rebellion until the Battle of Jonggok, December 18. Chungcheong was the location of the December battles. In October 9, before the Council of Samrye had reached its conclusion, there was a minor skirmish in Daejeon, at the time a small village called Hanbat, between rebels and governmental forces. This came to be called the Daejeon Massacre. 78 governmental soldiers were given alcohol by rebels, then killed while drunk. Meanwhile, the city of Cheongju was the Donghak division commanded by the Great Jeobju, Son Cheonmin. Kim Gaenam and Son Cheonmin cooperated to attack Cheongju in the Battle of Cheongju, December 9, 1894. Because Kim did not fight at Ugeumchi, his army of 25,000 was still strong. When Jeon and Son gathered the rebel forces in Samrye, Kim did not cooperate. He began his own attack only after the Battle of Ugeumchi, and by December 9 reached Cheongju Fortress. Kim's opponent was Kuwabara Eiziro and his Japanese battalion, along with governmental troops with little morale. Kim's 15,000 men attacked from south, while Son Cheonmin's 10,000 men attacked from the north. The defenders of Cheongju lacked morale due to the Daejeon Massacre, and Kim nearly broke through the south door. Eiziro suddenly assaulted the rebels, and Kim retreated to Muneui. 200 rebels were killed in the Battle of Cheongju. The rebels also lost large amounts of weaponry, including many rebel banners, thousands of bows and arrows, 140 rifles, 2,000 flintlock muskets, 150 kilograms of gunpowder, 2 cannons, and 50 horses. After the Battle of Cheongju, Kim went south to Muneui, but were defeated once more. He went in hiding, just as Jeon Bongjun did. Although Choe Sihyeong had banned rebel activities among the Northern Jeob during the spring of 1894, many Chungcheong rebels were Northern Jeob. By March 22, rebels of Hoenggang, Yeongdeung, Cheongsan, Boeun, Okcheon, Jinjam, Muneui, Goesan, and Yeongpung were already giving the wealth of the rich to the poor, and beat and castrated corrupt Yangban. However, the Chungju rebels temporarily stopped activities due to the beginning of the Sino-Japanese War. The Battle of Pungdo and the Battle of Seonghwan were both fought in Chungcheong Province, and the war sparked anti-Japanese sentiment among the former rebels. In July, 1,000 rebels wandered through various towns, building earthen fortresses in preparation for a Japanese invasion of Chungcheong. The rebels took weaponry from the governmental storages and trained themselves. In August, there was a small battle between the Northern and the Southern Jeob. In October 12, Choe Sihyeong ordered the Northern Jeob to revolt. The rebels of Northern Chungcheong organized under the Jeob and Po, and began active revolts. There were more than a hundred battles that took place in Northern Chungcheong in this period. The Gwandong Po won against a Japanese battalion in the Battle of Goesan under the leadership of Sim Songhak. The rebels then reached Boeun, thus severing all direct roads between Seoul and Jeolla. The revolt flared even greater when Son Byeongheui joined the Northern Chungcheong rebels. Survivors among the Battle of Taein joined the rebels as well. In December 18, 2,600 rebel forces gathered in Jonggok. The rebels included the great Northern leader Son Byeonghui, whose family lived near Jonggok, and the patriarch of Donghak, Choe Sihyeong. Japanese sources report that the rebels were cooking meals when the Japanese attacked them. Because of the surprise attack, the rebels were not able to put up a suitable defense, leading to 2,500 rebels out of 2,600 being killed. (Some scholars prefer the term Jonggok Massacre.) Both Choe and Son survived, but fled towards the south. Minor skirmishes continued in this region until December 28. The rebels of Cheonan, Hongseong, and northwestern Chungcheong were defeated in the Battle of Mount Seseong. This battle was also the key to Jeon Bongjun's plan to capture Seoul. In August, 1,500 rebels revolted in Cheonan, and took governmental weapons. After organizing their army in Mount Soto, the rebels camped in Mount Seseong with their newfound weaponry. Mount Seseong was more of a low hill, 22 meters high, defended by a low wall, which was in use since the Proto-Three Kingdoms Age. The rebel leaders were Kim Yongheui, Kim Hwaseong, Kim Seongji, Kim Bokyong, Kim Yeongu, and Won Keumok. In November 18, two Japanese platoons were located in the northern slopes, another platoon to the northeast, and another to the southeast. In dawn, the southeast platoon ambushed the rebels, who resisted for two hours, aided by their superior knowledge of the terrain. However, they were forced to retreat to the west, where they were ambushed again by the two northern platoons. 370 rebels were killed, 770 were wounded, and 17 were captured. The rebels also lost 140 guns, 2 trumpets, 228 spears, 26,500 Chinese bullets, 30 flags, 226 sacks of rice, and 13 sacks of barley. Kim Bokyong was captured and executed on the spot, and the other leaders were executed in November 24 and 27. The hill was known as Mount Siseong, meaning 'Mountain washed with blood'. Because Gyeonggi was very close to Seoul, rebel activities in Gyeonggi were few. The largest Gyeonggi rebel groups, numbering 1,000 rebels, were in Yicheon, Yeoju, Anseong, and other parts of Southeastern Gyeonggi. The Gyeonggi rebels retreated south to Chungcheong, joining the rebels of Northern Chungcheong. Most were killed in the Battle of Jonggok (see above). Gangwon rebels can be divided into two groups: the rebels of Gangneung and the rebels of Hoengseong and Wonju. Rebels from Northern Chungcheong or Gyeonggi occasionally crossed into Wonju. Gangwon rebels were especially marked by guerrilla warfare. In these regions, rebels would occupy Gangneung, then flee to mountainous locations such as Pyeongchang, then return to Gangneung. In September, more than 1,000 rebels attacked Gangneung, which lacked defenses. The rebels gave one sack of rice to each peasant by taking the wealth of the rich, and built strongholds in most marketplaces. The rebels formed their own court, lowered taxes, and punished corrupt Yangban and rich Sangmin. In September 7, an anti-rebel battalion led by Yi Hoewon assaulted the sleeping rebels in the rainy dawn. 20 rebels were killed, and Yi's forces took 7 guns, 157 spears, and 2 horses. The rebels passed the Daegwanryeong Pass into Pyeongchang. By late September, the rebels had reorganized and recaptured Gangneung. they also occupied Pyeongchang, Yeongweol, and Jeongseon. In response, the Japanese army sent Captain Ishimori against the Gangneung rebels in November 3. In November 5, 10,000 rebels had a two-hour-long battle against Ishimori's troops, but were ultimately defeated. The rebels fled to Jeongseon. In November 6, the governmental troops killed 10 rebels in Jeongseon and burned down 70 houses. The rebels again fled to Pyeongchang. Ishimori fought against 3,000 rebels in Pyeongchang in December 1, 1894. The rebels scattered after an hour of battle. 70 rebels were instantly killed, 30 died from their wounds, and 10 prisoners were killed for attempted rebellion. The Gangneung rebels ceased to exist after this battle. Rebels of these regions were mostly guerrillas in a mountainous terrain. The rebel leader was the legendary Cha Giseok, the Great Jeobju of the Gwandong Region. He led 1,000 rebels, who punished corrupt Yangban and collected taxes from merchants. It is said that Cha killed hundreds of Yangban. In October 13, Cha attacked Dongchang, where the taxes collected in Gangwon were brought to Seoul by boat. He burned down Dongchang and gave the taxes to the peasants. The magistrate of Hongcheon reports that after the destruction of Dongchang, more and more people joined Cha's army. The government asked Maeng Yeongjae, a Confucian scholar, to conquer Cha's 'crowd of roving thieves'. Maeng, who was suppressing the rebels of Yicheon at the time, gladly obliged. In October 21, Maeng and Cha battled in the Jangya Fields, in which more than 30 rebels were killed. The rebels fled to Seoseok, into a pass called 'Seonang Pass'. It was so named because there was an altar to the deity Seonangshin in the pass. In October 22, 2,000 rebels were killed in the consequent Battle of Jajak Pass, the largest battle in Gangwon Province before the Korean War. The rebels lacked guns, and they used birch branches as weapons. They also lacked pots, and cooked rice over cattle hide. Because of the narrowness of the pass, the rebels were crowded, and it was easy for Maeng's troops to fire into the camp and kill rebels. Maeng himself reports that "it was impossible to see how many died", but descendants have given an estimate of 1,800~2,000. Descendants also report that the battle continued for three or four days. The Seonang Pass was renamed Jajak Pass, because the blood made a 'Jajak' sound as it rolled down the pass. In October 26, the survivors, including Cha, regathered. In November 11, they began the Battle of Mount Odae, in which Maeng's soldiers surrounded Mount Odae and began to climb it and defeat the rebels inside. 100 rebels were killed, and 40 houses were burned. Cha was captured in November 14, and beheaded for treason in Chuncheon. True Donghak, "who mutter incantations and believe that their faith shall cure diseases, bring wealth, and lengthen life"
Temporary Donghak, "who do not believe the teachings.......but join the Donghak religion"
False Donghak, "those.....who hate foreigners..... are suppressed by local magistrates, suffer from inflation, or can no longer mine for gold. Most are gold miners, and that is because.....gold mining was banned last year, and...... they no longer have money, and they wish for revenge". Haeju was one of the two provincial capitals to fall to the rebels (the other being Jeonju). The defeat of the Haeju rebels are documented in Lieutenant Suzuku's Conquest of the Donghak of Hwaghae. By November 27, the rebels had captured most of the Hwanghae cost, including Haeju, without a major battle. However, in the dawn of November 27, 400 rebels camped on Pyeongsan were assaulted by governmental forces, and fled south to Nucheon. Knowing that the Japanese and the government troops were chasing them, they hurriedly fled Nucheon as well. Suzuku captured many Donghak food supplies in Nucheon, including "hundreds of sacks of millet". In November 29, Suzuku captured the town of Gajichon. However, there were no men in Gajichon. When the women of Gajichon were interrogated, they revealed that all grown men had been ordered to go to the town of Onjeong. Suzuku's soldiers burned four sacks of rice cakes in Gajichon. The Japanese reached Onjeong, only to find it empty. The magistrate of Onjeong said that the rebels had never come, and that they were to go to Haeju, rather than Onjeong. Haeju, too, was completely empty. The governor of Hwanghae said that "every town outside of Haeju is full of thieves......two-thirds of all towns in Hwanghae are full of the Donghak raiders". With the guidance of the officials of Haeju, the Japanese defeated hundreds of rebels in the hour-long Battle of Gohyeonjang, killing "tens of thieves". They also captured and beheaded a number of rebels, and burned five houses. Kim Gu and his rebels sought to reoccupy Haeju, and attacked Japanese scouts in 6:00 am of December 2, 1894. The battle continued until 8:00, when the rebels finally fled. Tens of rebels were again killed, and many were captured. From the captured rebels, Suzuku discovered a manifesto written by Choe Sihyeong, the Donghak patriarch. The manifesto proved that the Haeju rebels were under the command of Choe Sihyeong and the Northern Jeob leaders. The rebels gathered in Cheongdan, 2.5 kilometers away from Haeju. 7,000 rebels were camped on the east and the south, and 400 were additionally hidden in the pine forests. 10,000 were camped 400 meters away, and 14,000 were camped a kilometer away. Because the rebels lacked rifles and other modern weaponry, they were crushed after three Japanese strikes. However, the rebels did not retreat.Because the Japanese also lacked ammunitions due to the large number of rebels, they finally directly charged at the rebels. Although the rebels only had old-fashioned muskets, the superior numbers of the rebels wore out the Japanese soldiers. The rebels fled, and were chased for 600 meters. Minor skirmishes continued until January 1895, and Kim Gu hid in the house of An Taehun, a Catholic and the father of An Junggeun, until 1896. Pyongan Province had little rebel activity. It suffered extreme casualties in the Sino-Japanese War, especially at the Battle of Pyongyang. There were occasional reports of rebels killing magistrates or attacking Japanese support lines, but such instances were rare. Also, there were only two Jeobju for all of Pyongan, compared with seven for Hwanghae and Gyeonggi, ten for Gangwon, seventeen for Chungcheong, nineteen for Gyeongsang, and twenty-five for Jeolla. The capture of Jeon Bongjun. He is in the center, seated in a carriage because his legs were broken in the escape attempt. Although Jeon Bongjun officially disbanded the rebel army after the Battle of Taein, many of the other commanders did not disband their respective armies until December. In December 1, Son Hwajung and Choe Gyeongseon disbanded their rebel armies in Gwangju and went in hiding. The same day, the great rebel leader Kim Gaenam was captured. Kim had been betrayed by a friend named Yim Byeongchan, and captured by 80 governmental soldiers who surrounded the house of Kim's brother-in-law. Kim was dragged to Naju. In December 13, he was put to death by beheading, and his corpse was ripped apart in five. The magistrate of Naju ate Kim's intestines and liver. Also by December, the Anti-Japanese Frontier had been pushed down to the southern coast of Korea. In December 7, the Japanese finally killed Kim Inbae, the Great Jeobju of Geumgu who had aided the Jinju rebels, in the Battle of Gwangyang Fortress. Kim Inbae's head was tied to a pole and displayed in Gwangyang. However, in Jangheung, the rebel leader Yi Bangeon captured Gangjin in December 7. In December 11, Son Hwajung was also captured. Meanwhile, the Japanese were attacking Yi Bangeon and the Jangheung rebels, which formed the last organized rebel army in the region. In December 15, the last major battle in Jeolla Province, the Battle of the Seokdae Fields, was fought between Yi Bangeon's rebels and Japanese. This battlefield is now one of the Four Battlefields of the Donghak Revolution. 30,000 rebels were present, and 2,000 were killed. As the 800 Japanese soldiers moved through Yeongam, Gangjin, Haenam, and Jindo Island, they engaged in a scorched-earth strategy, killing 600 civilians and burning villages and sacks of rice. Yi Bangeon was finally captured in Christmas 1894 and beheaded with his son in Seoul. With the death of Yi Bangeon, the rebels had been completely exterminated, except for 30 rebels who hid in Mount Daedun. Sometime in December, Choe Gyeongseon was also captured. In January 1, 1895, the last rebel leader remaining, Kim Deokmyeong, was captured in Wonpyeong. The four leaders were put to trial, and Jeon Bongjun's testimony during the trials forms the Testimony of Jeon Bongjun. In his testimony, Jeon emphasized his views that Donghak believers formed only a small fragment of the rebels, the majority being peasants seeking vengeance. However, he also explained the theology of Donghak to the court. He also denied connections with the Great Regent Heungseon. In March 29, the four leaders were hanged for treason. Later, Confucian scholars stole the bodies, beheaded them, and displayed the heads on public. Only Choe Gyeongseon's body has been identified, and the locations of the other three are unknown. Chaining rebels together, then drowning them in the sea. The coast was said to be littered with corpses. Piercing the skull with a sharp wooden stick, then burning the stick so that the brain would explode. The Northern leaders Choe Sihyeong and Son Byeongheui, meanwhile, had fled after the defeat at Jonggok. In January 1898, Choe and Son escaped arrest because Kim Yeonguk had been misidentified for Choe Sihyeong. In April 1898, however, Choe was captured and put on trial. Because the government wished to execute Choe before he died of disease, the trials were speedily done. Son Byeongheui and a group of other believers attempted to free Choe by bribing the judges with land, but Choe was executed after a month. He was buried in the cemetery with a small marker saying 'Donghak Ringleader Choe Sihyeong'. That night, Son and the others secretly entered the cemetery and took Choe's body. Choe was reburied in Gwangju. A part of the rebel requests, including the remarriage of widows and the freeing of slaves, was included in the Gabo Reform. However, the reform was not supported because it did not include land reform, which was the peasants' greatest need. Many rebels later joined the Righteous Army. The 1895 Righteous Army were led by Confucian scholars who killed rebels when they attempted to join the Righteous Army. However, the rebels of 1905 and 1907 were almost entirely composed of rebels . For example, Yu Eunshik of Chungju killed his lieutenant when he revealed himself as a former rebel. Jeon Haesan, the most famous of the Jeolla Righteous Army leaders, was often called the 'son of Jeon Bongjun', and participated in more than 70 battles from 1905 to 1910 against the Japanese before he was hanged in 1910. However, in his War Diary of Jeon Haesan, Jeon Haesan says that he "did not like to be called the 'son of Jeon Nokdu'(Jeon Bongjun's nickname)", presumably meaning he was not Jeon Bongjun's son. However, the current edition of the North Korean history textbook claims that 'the patriotic line' descends from Jeon Changhyeok (Jeon bongjun's father and Gyojo Shinwon leader) through Jeon Bongjun to Jeon Haesan. The South Korean Ministry of Education claims that this is North Korean textbook revisionism, in order to glorify Kim Il-sung by comparing the Kim family to the Jeon family. Many former rebels became nationalists and independence activists. The tiger hunter Hong Beomdo, who was influenced by Donghak, became a guerrilla leader of Manchuria. Kim Gu the 'Baby Jeobju', who fought at the Battle of Haeju, became a profound nationalist and one of the most respected Korean leaders. The Donghak religion also experienced a profound change. With the death of Choe Sihyeong, Son Byeongheui became the third patriarch. In order to escape persecution as 'rebels', he renamed Donghak 'Cheondoism' and fully established the 'Human is Hanulnim' doctrine, thus making Cheondoism a fully pantheistic religion (Choe Jeu seems to have been a panentheist). Cheondoism was legalized in 1905, but Son was imprisoned in 1919 for leading the March 1st Movement and died in prison. Son's son-in-law, Bang Jeonghwan, was also a Cheondoist who became a famous child activist, and founded the Children's Day in Korea.The artist Suh Yong-sun drew a work titled Donghak Peasant Revolution on canvas using acrylic paint. The revolution was fundamentally based on the Donghak religion, and should thus be called the 'Donghak Rebellion' or the 'Donghak Revolution'. This argument is based on that every pre-1922 source called the rebellion 'Donghak Rebellion', and on that every major leader was a Jeobju or Poju. This was the stance made by South Korea when it was ruled under a military junta. The revolution was fundamentally based on the peasants who were suppressed by the government, and should thus be called the 'Peasant Rebellion of 1894', the 'Peasant Revolution of 1894', or the 'Peasant War of 1894'. This argument is based on Jeon Bongjun's testimony: "There were many angered peasants and few Donghak". This is the official stance made by North Korea. The rebel leaders were Donghak believers, but the actual armies were aggravated peasants, and should thus be called the 'Donghak Peasant Revolution', 'Donghak Peasant Rebellion', 'Donghak Peasant War', or the 'Donghak Peasant Movement'. Jeon said on his testimony: "Our leaders were Donghak, but the army were peasants". This is the current South Korean position. The role played by King Gojong's father, the Great Regent Heungseon, is open to controversy. Jeon Bongjun first met Heungseon in 1890 in Unhyeon Palace. 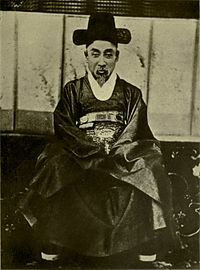 Jeon actually lived with the Great Regent Heungseon from 1890 to 1892, and revisited him in February 1893. In the meeting, Jeon said to the Heungseon: "I wish to die for the country and the people". There were many rumours that the Heungseon had secretly caused the rebellion in this meeting. [The Great Regent] is planning for a great riot as its leader, which will begin in summer or autumn. Already, the leaders are buying weapons from China and Japan, and 4,000 rifles have already been bought. A few are from Japan, and a few Japanese have joined this scheme, of which the Japanese government knows nothing about. In A History of Donghak, Oh Jiyeong claims that the Great Regent attempted a massacre of pro-Japanese politicians in August 1894, simultaneous with the time when Jeon had planned an attack on Seoul. During his execution, Kim Gaenam testified that Jeon had been secretly meeting the Great Regent Heungseon. However, the other four leaders refused to connect the Great Regent with the revolution. The Japanese historian Seito argued that the Donghak Peasant Revolution had been backed by a Samurai group named Genyōsha, who landed in Busan in June 27, 1894. The claim is however heavily contended by Korean historians. Seito's account is generally regarded as pseudohistorical by Korean historians. Jeon only had 20 followers in the beginning of the Gobu Revolt, compared with 600 in Seito's account. Also, Seito's list of battles and Jeon Bongjun's account in the Jeon Bongjun Gongcho are different. Additionally, Seito records that an alliance of rebels and Genyosha defeated governmental forces from June to August, in which Jeon would be installing Jibgangso agencies. However, certain Korean historians such as Yi Yihwa and Japanese historians generally regard Saito's account to be partially valid, especially as there were a large body of Japanese soldiers in Korea at the time. In The Founding of Cheondoism, it is recorded that two Japanese men named Danaka Jiro and Dakeda Hanshi and their fifteen followers, holding dynamite, gave Jeon a gold watch and a horse, and had a council with Jeon, which was done not with translation but by using written sentences (both knew Chinese characters). The Japanese asked Jeon to ally with Japan and drive out China to make Korea truly independent. Later in 1895, Danaka attempted to free the imprisoned Jeon and take him to Japan, but Jeon refused, calling Japan "my enemy" and saying "It is not my purpose to seek my petty life through the hands of an enemy". He also said that "I am your enemy and you are my enemy". However, Jeon also asked the Genyosha to attempt to protect the rebels from execution. The Great Regent Heungseon is known to have hired ronin, or former Samurai, in order to kill political enemies. It has also been speculated that it were Genyosha members who killed Empress Myeongseong, the last queen of Korea. The Donghak Peasant Revolution gave way for various folk songs. The most famous is the Oh Bird, Oh Bird, Oh Roller (the 'roller' being mentioned is the broad-billed roller). In this song, the 'roller' are the Japanese soldiers (who wore blue uniforms). The 'Nokdu fields' is Jeon Bongjun, and 'when the Nokdu flower falls' is the execution of Jeon Bongjun. The 'jelly seller' are the peasants of Korea. 'Summer' refers to the Hucheon, the Donghak concept of Paradise, and 'winter' refers to the persecution of the rebels. 'Why did you come out' refers to the anger of the peasants at foreign intervention. This song is sung all over Korea, and seems to have been first sung at the execution of Jeon. There are many versions of this song, with different lyrics. Another song was sung in September, at the revolution's zenith, but was soon forgotten after the fall of the rebels. This is in contrast to the Oh Bird, Oh Bird, Oh Roller above. In 1820, a few days after Yi Seogu became governor of Jeolla, Yi went south to Seonun Temple, Mujang, and see what was inside the navel of the Stone Buddha of Dosol Cliff. But as he was opening the navel, thunder struck, and he could not read the parchment inside, but had to seal the navel again. He had only read the first line: "Yi Seogu, governor of Jeolla, will read this." No one dared read the parchment, for they feared the thunder. In August 1893, in the Jeob of Jeongeub, there were words about the parchment of the Buddha. son Hwajung said he would like to read it, if only for the thunder. Then, the believer Oh Hayeong said that they should not worry about the lightning: "I hear that when such parchments are hidden, the hider casts spells of lightning so that people cannot read it. I do not think anything will happen. The lightning spell will already have been cast when Yi Seogu attempted to open the seal, and the spell will have been gone. We must open it when it is time, and I shall take all responsibility." So they gathered thousands of coils of ropes and hundreds of hammers and crushed the navel of the Buddha and took out the parchment inside. They had imprisoned the Buddhists in fear of intervention, and they reported the Donghak believers to the government. That day, the magistrate of Mujang captured hundreds of Donghak believers, with Gang Gyeongjun, Oh Jiyeong, and Go Yeongsuk at their head. The magistrate of Mujang ordered the Donghak believers to hand over the parchment and reveal the location of Son Hwajung. They were beat and flogged until their bodies were hunks of flesh. But the parchment was with Son Hwajung to the north, as were the other leaders, and after ten days of torture, the three leaders were executed for murder and thievery and the others were flogged and sent away. Later stories claim that the parchment in question was a secret guideline on revolutions that was written by Jeong Yakyong, a Silhak scholar, and that Jeon Bongjun modeled the revolution after the book. Others claim that the parchment's destiny was to bring the downfall of the Joseon Dynasty. The current Dosol Cliff Buddha has a squarely shaped hole in place of the navel. ^ a b McClain 2002, p. 297. ^ a b Yi 2012, p. 21. ^ a b South Korea government 1976, pp. 128. ^ Choe 2007, p. 264. ^ Naver "Alive Korean History Textbook" (in Korean). Retrieved 9 January 2013. ^ a b Yu 2005, p. ???. ^ Naver "Encyclopedia of the Joseon Dynasty>Imsul Revolts" (in Korean). Retrieved January 25, 2013. ^ Yi 2012, pp. 21-22. ^ Yu 2011b, p. 359. ^ "Cheondoist Seoul District". Retrieved January 25, 2013. ^ Naver "Encyclopedia of Korean History>Joseon>Hucheon Gaebyeok" (in Korean). Retrieved 5 January 2013. ^ a b c d Park 2009d, p. ???. ^ Naver "Encyclopedia of Korean History>Joseon>Jeob.Po" (in Korean). Retrieved 5 January 2013. ^ Naver "Dusan Encyclopedia>Yi Pilje's Revolt" (in Korean). Retrieved January 25, 2013. ^ Naver "Internet Biography of Son Byeongheui" (in Korean). Retrieved January 24, 2013. ^ Jeon Bongjun Gongcho (The Testimony of Jeon Bongjun). ^ Naver "Encyclopedia of Korean History>Joseon>Gyoju Shinwon Movement" (in Korean). Retrieved 5 January 2013. ^ Yi 2012, p. 74-75. ^ Lone & McCormack 1993, p. ???. ^ Yi 2012, pp. 69–70. ^ a b Hwang 1910, p. ???. ^ Yi 2012, p. 77. ^ Yi 2012, pp. 76–77. ^ Shin Byeongju. "Shin Byeongju's Finding Roads in History (32)Currency of the Joseon Dynasty". Segye Daily. Retrieved 28 March 2013. ^ a b Yi 2012, p. ???. ^ a b "Jeongeub Donghak Peasant Revolution>A Shortened Revolution History>The Misconduct of the Gobu Magistrate". Archived from the original on 2015-01-03. Retrieved 29 March 2013. ^ Yu 2011b, p. 276. ^ Naver "Encyclopedia of Korean Culture and History>Gobu Minlan" (in Korean). Retrieved April 6, 2013. ^ Yi 2012, pp. 95–102. ^ Yi 2012, pp. 108–109. ^ Yi 2012, p. 112–113. ^ Yi 2012, pp. 114–115. ^ Yi 2012, p. 120. ^ a b Gwak 2011, p. ???. ^ Naver "Basic Korean History Terminology-Jeonju Truce" (in Korean). Retrieved 10 January 2013. ^ Boulger & Hazeltine 1893, p. ???. ^ Choe 1862, p. ???. ^ Naver "Encyclopedia of Korean Ethnic History>History>Modern>Jibgangso" (in Korean). Retrieved 10 January 2013. ^ Yi 2012, p. 265. ^ a b c Oh 1940, p. ???. ^ Yi 2012, p. 87. ^ Yi 2012, p. 186. ^ Yi 2012, p. 89. ^ Naver "Encyclopedia of Korean Ethnic History>History>Modern>Battle of Ugeumchi" (in Korean). Retrieved January 11, 2013. ^ a b c Yi 2012, p. 103. ^ "Doopedia-우금치전투". Retrieved August 5, 2013. ^ "Encyclopedia of Korean Ethnic History-우금치전투". Archived from the original on October 4, 2013. Retrieved August 5, 2013. ^ a b c d Yi 2012, pp. 105–108. ^ Yi 1894, p. ???. ^ Yi 2012, pp. 243–244. ^ "Encyclopedia of Jindo Culture - Yi Heuiseung (Modern Jindo Official)". Retrieved March 31, 2013. ^ "Encyclopedia of Jindo Culture - Donghak Peasant Revolution". Retrieved March 31, 2013. ^ "Encyclopedia of Hadong>Battle of Mount Goseong Fortress". Retrieved January 14, 2013. ^ Naver "Second Revolt of the Gabo Peasant War" (in Korean). Retrieved January 15, 2013. ^ "Digital Encyclopedia of Cheongju>Battle of Cheongju Fortress". Retrieved January 15, 2013. ^ "Digital Encyclopedia of Chungju>Donghak Peasant Revolution". Retrieved January 15, 2013. ^ "Culture Contents.com>Battles/Diplomacy>Korean Battles>Battle of Mount Seseong". Retrieved April 7, 2013. ^ Yi 2012, pp. 251–253. ^ a b c d e Yi 2012, p. 308. ^ History Controversies Study Agency 1994, pp. ???. ^ "Battle of the Seokdae Fields, Jangheung" (in Korean). Retrieved January 17, 2013 – via Naver. ^ 한국민족문화대백과>역사>근대사>전봉준공초 (in Korean). Retrieved July 5, 2013 – via Naver. ^ Choe 2007, p. 176. ^ Naver "Jeon Haesan Jinjung Ilgi, Encyclopedia of the Culture of Korea" (in Korean). Retrieved January 23, 2013. ^ Park 2009e, p. ???. ^ Naver "Naver Cast:Today's Korean-Suh Yong-sun" (in Korean). Retrieved April 7, 2013. ^ a b c Choe Hwaju (June 24, 2013). "'Historical facts' do not talk on their own". Hangyeore. Retrieved July 5, 2013. ^ Naver "Naver Encyclopedia-Donghak Movement" (in Korean). Retrieved July 15, 2013. "Although there is a theory that postulates that the Donghak was only a motivation for a few extremists, or that it only acted as a device for peasants to express their already existing desire for change, it misrepresenting Donghak's role as an ideological start or the religion of the leading rebels." ^ a b "Daum Encyclopedia>Jeon Bongjun" (in Korean). Archived from the original on 2013-01-12. Retrieved January 19, 2013. ^ Yu 9999, p. ???. ^ "Doopedia-The Second Donghak Revolution". Retrieved July 15, 2013. ^ Misang 9999a, p. 327. ^ a b Yi 9999, p. ???. ^ Misang 9999b, p. 345. ^ Yu 2011a, p. ???. Donghak Peasant Revolution pages at the official website of Jeongeup City, in North Jeolla Province, South Korea. Books are sorted by author family name, the last part in English names and the first part of a Korean name. Yi, Yihwa (2012). 동학농민운동(평등과 자주를 외친) [The Donghak Peasant Revolution: Claiming for Equality and Statehood] (in Korean). illustrated by Kim Tae-hyun. Seoul: Safari. p. 327. ISBN 9788-9648-0765-1. Lone, Stewart; McCormack, Gawan (1993). Korea Since 1850. Australia: Longman Cheshire Pty Limited. p. 226. ISBN 9780-3120-9686-1. McClain, James L. (2002). Japan, a Modern History. New York: W.W. Norton & Company. pp. 1–724. ISBN 9780-3930-4156-9. Boulger, Demetrius Charles; Hazeltine, Mayo W. (1893). "The War with Japan and Subsequent Events". China. Kessinger Publishing (reprint 2010). pp. 1–550. ISBN 9781-1633-3067-8. Misang, John (1999). 미상 [The Founding of Cheondoism] (in Korean). pp. ???. Misang, John (1999). 미상 [Korean Folk Culture] (in Korean). pp. ???. South Korea government (1976). 미상 [Social Study Topographical Textbook] (in Korean). pp. 1–128. Choe, Sihyeong (1862). 용담 유사 : 수운 가사 [Yongdam Yusa] (in Korean). 대원 출판사, Daewon Publisher. ISBN 8972616087. 세종 출판 기획; Sejong Chulpan Kihoek (2000). 용담 유사 : 수운 가사 [Yongdam Yusa] (in Korean). 대원 출판사, Daewon Publisher. pp. 1–141. ISBN 9788-9726-1608-5. Oh, Jiyeong (1987) [1940, Yeongchang Seogwan (?)]. 동학사(대광민속총서 1) [A History of Donghak] (in Korean). 대광문화사, Daekwang Cultural History. pp. 1–243. ISBN 9788-9705-1022-4. Yi, Deokil (1999). 미상 [A History of Controversies] (in Korean). Yi, Guytae (1894). Diary of the Reconnaissance Head of the South (in Korean). Yu, Eunshik. The Conservative Nature of the Rebellion of 1894 (in Korean). Yu, Hongjun (유홍준) (2011). 남도 답사 일번지 [The First in the South]. 나의 문화 유산 답사기 [Exploring my Cultural Heritage] (in Korean). 1. Changbi. pp. 1–348. ISBN 9788-9364-7201-6. Yu, Hongjun (유홍준) (2011). 산은 강을 넘지 못 하고 [Mountains Cannot Cross Rivers]. 나의 문화 유산 답사기 [Exploring my Cultural Heritage] (in Korean). 2. Changbi. pp. 1–466. ISBN 9788-9364-7202-3. Choe, Yongbeom (2007). 하룻밤에 읽는 한국사 [Reading Korean History in one Night] (in Korean). Seoul: Paper Road. pp. 1–426. ISBN 9788-9958-2663-8. Gwak, Eunju (2011). 최제우 동경대전(만화)(서울대선정 인문고전 50선 21) [Choe Jeu's Donggyeong Daejeon (Manhwa)] (in Korean). Junior Kim Yeongsa. pp. 1–215. ISBN 9788-9349-3327-4. Park, Eunbong (2009). 한국사 편지. 4(12살부터 읽는 책과함께 역사편지) [ABC of Korean History (4)] (in Korean). 책과함께어린이, Books for Children. pp. 1–260. ISBN 9788-9912-2147-5. Park, Eunbong (2009). 한국사 편지. 5(12살부터 읽는 책과함께 역사편지) [ABC of Korean History (5)] (in Korean). 책과함께어린이, Books for Children. pp. 1–300. ISBN 9788-9912-2148-2. Yu, Gyeong-won, 유경원 (2005). 이현세의 만화 한국사 바로보기. 9(조선시대) [Quick view of Yi Hyeonse Manhwas about Korean History. 9 (Joseon Dynasty)] (in Korean). 녹색지팡이, Noksaek Jipangi. pp. 1–235. ISBN 9788-9914-8109-1.